​Being third generation in the antiques trade, with a childhood spent in the family auction business in England and 25 years experience as a professional furniture restorer in the USA makes me uniquely positioned to look at period furniture with a lifetime of experience handling and inspecting all forms of European & American pieces made in the last 400 years. Both chairs were in my charge to be inspected and a report furnished. Below is the report on one of the chairs. ​18th century furniture styles were moved by fashions of the period, 19th century copies are just that, copies of a particular style. 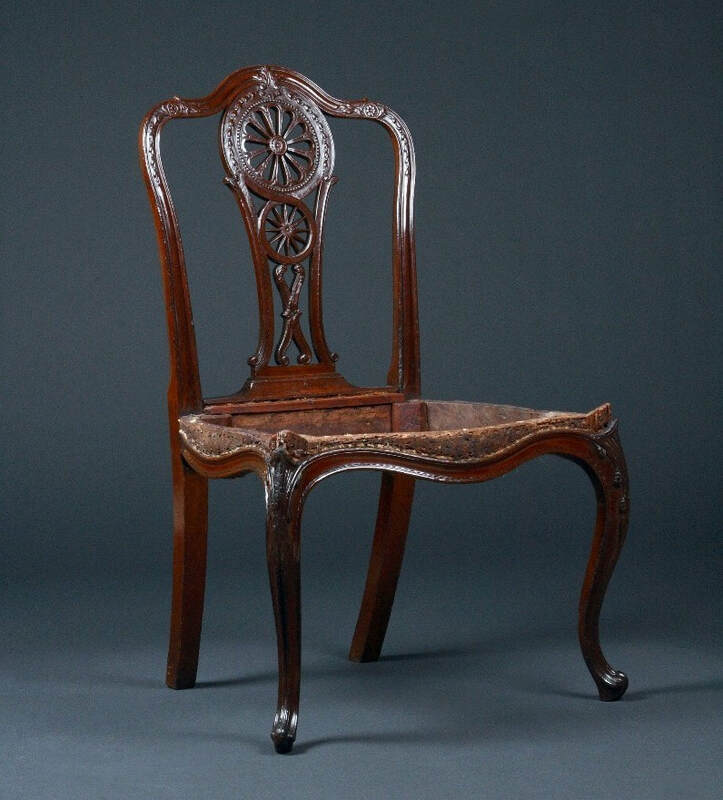 The chair in question is a transitional piece, bridging two fashions of the period-the Rococo and the Neoclassical(upper and lower parts of the chair) 19th c. copies attempt to emulate a particular fashion, I.e. the Rococo or the Neoclassic (Chippendale/Hepplewhite /styles) in its entirety never in transition. With a view to authenticating a chair one must first observe the form, this chair encompasses two eras in transition with fluidity and success as it is not an attempt at copy it is an interpretation of styles, this observation is very important in evaluating the chair, when observing the form of this particular chair the aspect of transition captured by combining both the Rococo & Neoclassic styles with such high quality and with such obvious success is the major obvious component when assessing form. When assessing the construction of the chair again all is correct for the period, a first observation when evaluating true period chairs and 19th c copies and generally a faithful guideline is to observe the lower part of the 'back splat', the 'shoe' or horizontal shaped bar fitted at the extreme lower part of the splat is a separate piece which was attached after upholstery and tacked to the seat rail, this is an integral part of assessing period and non period construction ( this part is present) when observing this element on any period chair as with this chair from the reverse (view) the splat appears to be flanked by two pieces of wood at the lower extreme, sometimes called a pieced lower back by some for want of better term, this appears as three pieces as the shoe fits over the lower extreme of the splat from the front creating the three piece appearance from the rear. On 19th century or Victorian copies the splat and shoe are integral and when viewed from the reverse show continuity from top to bottom with no piecing, an elementary observation and faithful to the overall authentication process. A subtle often overlooked element of the shoe is the shrinkage process with regard to how the 'shoe' was fitted in the 18th century. After construction the chair was upholstered, after upholstery the final element was the attaching of the 'shoe' over the upholstery, this also is a pointer to age as the shoe was tacked to the seat frame, over centuries shrinkage occurred around the tacks creating separation between the tack and the Mahogany 'shoe' piece, this can only occur over much time and becomes part of the authenticating process when looking at minor filled holes around the attached area, once again the occurrence due to movement between the tacks and the wood, this is a subtle observation but a faithful observation, this area has touch up and minor filled holes. Two elements with regard to period in a small piece of wood/shoe point to authentic. A. The shoe itself not used in Victorian copies and B. the shrinkage and subsequent repair or filling to space created as the wood shrinks across the grain, this would have been exacerbated over multiple upholstery jobs throughout the centuries as no fabric could be removed or attached without the removal of the shoe. This leads to the most important most qualifying aspect of the authenticating process when observed alongside form/construction etc, the frame and evidence of many upholstery attempts and more importantly the evidence of irregular holes and core loss to areas of multiple breaches in the frame caused by nail after nail over evidently numerous coverings. 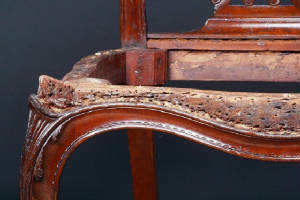 The differing hole sizes are important as the first nails used during early upholstery on this chair were hand cut and irregular and as with all shrinkage over time the initial penetrating hole surrounding the early nails expanded to look larger and clumsier and over time dark areas surround these holes this darkening is the reaction over time of the Mahogany to the iron. The later upholsterers on this and many other early chairs go to great lengths to remove all previous fastenings to create a clean surface to re-upholster, however the darkness surrounding the early holes remains and although a subtle and often covered (fabric) observation this again is a faithful part in the overall jigsaw of authentication. 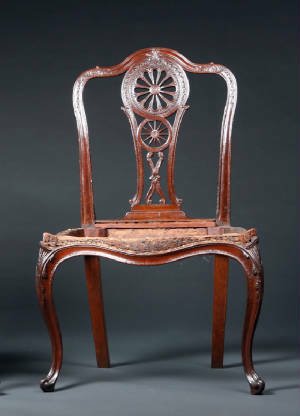 Hence the often stripped down frame presented in publications as with this chair un-upholstered showing the years and generations of use the one important impossible to fake aspect uncovered showing period work on the inside frame also. 19th century scratch stock for frame construction was begun using powered cutting such as steam band saws this is always, always evident and regardless of exterior carving or decoration one quick look at the inner frame on any post mid 19th c. chair will show evidence of such. 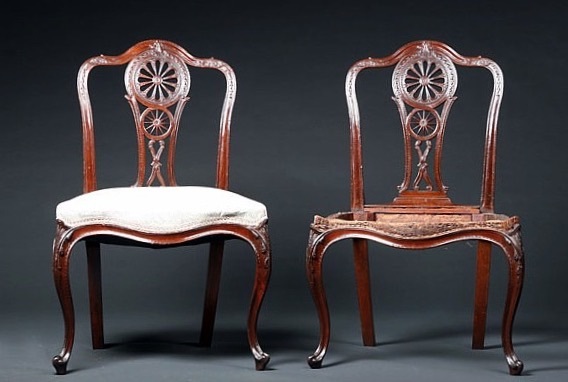 Post mid 19th century inner frames of chairs will show regular mechanical cutting lines or concentric arched cutting lines without exception some evidence however subtle or however many attempts to conceal and or remove will remain. This obviously is often the most evident tell tale sign in the “Is it Period or Is it a Copy” deduction. We do not see this on this chair, what we see is evidence of period hand smoothing on the inner rails, subtle but present and positively no evidence to the contrary and perfectly in tandem with the rest of the elements deducted in authenticating as a true period chair. 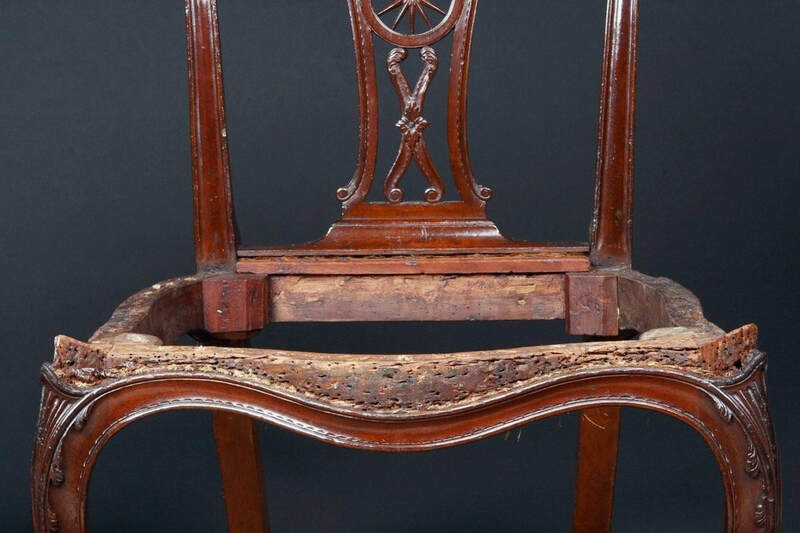 Evident in the images is the close up showing the extreme rear frame which as was not used for carving and left plain was (as is often the case on true period chairs) a soft wood veneered at the rear with Mahogany. Inner back frame shows minor and previous worm activity concentrated only at this soft area and most probably the cause of the softwood rear glue block and upholstery strip being lost over time, there has been minor touch up to this inner softwood piece and subsequent veneered outer side but nothing major and certainly to be expected. The front softwood glue blocks are original and hand smoothed/shaped and are also notched slightly to fit the form of the upper inner leg a subtle but higher quality aspect in the overall picture of construction. With regard to construction the frame parts are joined with expected period joinery with each attached using tenon joints not the drilled and dowelled construction used on post mid 19th century chairs. The outstanding and highly skilled carved splat is one piece of wood, with no laminating or piecing, and of a standard so high an almost impossible feat for anyone less qualified than a highly skilled highly competent carver, certainly time consuming and expensive (not conducive to the fast paced more mass produced copies of the Victorian era). Also on any post mid 19th century chairs the carving which has not had multiple century exposure to wear and use is sharp, the carving on this chair is softer due to centuries of handling and polishing and waxing and is completely correct for a period chair. Every aspect generally accepted in authenticating period work is met with success on this chair. In years of handling and observing hundreds if not thousands of pieces one is also observing hundreds if not thousands of surfaces and finishes and my opinion of the surface of this chair is of an early deep rich patina, with closed pores and nice color, even around the now exposed bare seat frame there is color at the lower extremes which correspond with the color on the finished exposed carved frame, which shows no signs of refinishing/removal of surfaces, the depth and color is deep and thick and the sort of surface that builds over generations. The downside to the use of studio photography for certain pieces is evident in many of the images showing this chair…the very strong close up lights used are very detrimental when evaluating finish, the glare of the lights reflecting off of the surface distorts the crisp carving and most important can appear glossy and not completely accurate as the surface is nice and silky combined with great depth to the timbers. Wear and scuffing to upper right carved cabriole and partial loss to 'rocaille' tip to end of toe. Expected gradual wear and minor losses and or damage commensurate with wear and age. 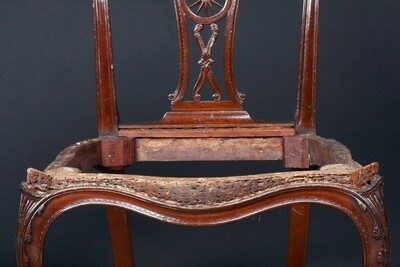 To sum up: A genuine mid Eighteenth century English chair requiring nothing more than the skills of a good upholsterer. This chair is one of a pair.